Nie and Nioi, these are basically crystals that are made up of either martensite or troostite. The temper line or Hamon, is made up of these 2 types of structures. 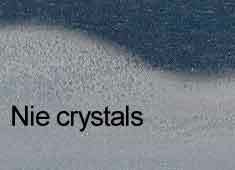 Generally, Nie is the larger crystal formation and is easily seen by the naked eye. Nioi is much smaller, and appears misty, but still bright. The brighter the hamon, usually the better the sword. There are many types of known hamon patterns, but basically there are only 2 types, straight (suguha) and undulating (midare). All others are variations stemming from the 2 basic hamons. For example, what is most commonly known as “choji” is properly called choji-midare, gunome is called gunome midare, notare is called notare midare, and so on. Combinations of 2-3 types of hamon exist in one sword. Sometimes a sword will have what is known as gunome-choji midare, such as those from the famous Kamakura Bizen School. Straight temperlines with slight variations are often called “sugu-ko midare”, meaning a basically straight hamon with midare like activity within. Well made Japanese swords also have what is known as “hataraki” or activity within the hamon. The above blade picture shows activity known as kinsuji and inazuma in a heavily nie covered hamon. Blades that are made up of mostly nie are called nie-deki, those that are made up of nioi are thus then called nioi deki. Smaller nie swords are often confused with nioi, but are actually called ko-nie, or what is known as “small nie”. More nie, however, isn’t always better. Even sized, thick, bright nie is a good sign that a sword is in healthy condition and manufacture. A finely controlled hamon also shows quality of a well tempered blade, and the skill of the smith. When a well polished sword is pointed at the proper light, the hamon should “pop” out easily if the sword is both healthy and well made. The kesho, or whitening of the hamon in polishing should NOT be confused for the actual temperline. Below are some variations of the most commonly seen hamons. There are many different types when one studies the entire history of sword making. However, most swords will have at least part of one of the examples shown below within the main portion of the temperline. Mino Style gunome midare. Blade is from the late 1500’s, and is made by the famous Seki smith Kanesada. Well shaped and very bright hamon shows the quality of this sword easily. Soshu styled notare midare. Blade is from the 1700’s, made by a smith that worked in the Soshu tradition. Famous Koto Soshu smiths worked in a similar hamon, but with more, higher quality nie. Yamato/Yamashiro styled straight (suguha) hamon, many smiths worked in this tradition. This particular sword is from the early 1600’s and is a copy of an older blade from the 1200’s. Bizen styled choji midare. This type of hamon is very popular among sword enthusiast for its hanayaka (bright / happy ) feeling. This sword is from the 1800’s and is made by a smith that reproduced the Bizen tradition very well. By developing this method of forging, the Japanese sword smith showed his skill not only in the base design and manufacture, but in his artistry as well. Hamons such as “3 cedar zig zag”, or Mount Fuji show the artistry with out losing the blades effectiveness as a weapon of choice. The Japanese sword, as well as Japanese swordsmanship have been often described as a type of “violent beauty”. Suguha (straight ) - Used from the beginning of Japanese sword manufacture to present day. Used by all five main schools (Gokaden) with different variations. Midare - Heian period to present day. Ko-midare, choji midare, notare midare, gunome midare, O midare, hako midare, sudare midare, doran gunome midare, yahazu midare, mimigata midare amd hitatsura midare. Choji (Clove Pattern) - Used from the late Heian period to present day. Many types were used and developed. Juka choji, kawazuku choji, saka choji are just some of the variations that were developed. Gunome - Used from the Kamakura period, but different variations were developed from the original design during the Shinto period, especially the hamon known as gunome doran used by the Sukehiro School. Kanemoto made the sanbon sugi (3 cedar zig-zag) gunome hamon famous for its cutting ability during the Muromachi period. Notare (Billowing wave) - Used from the late Kamakura period to present day, but ko-notare was seen in earlier periods as part of some hamons. The Soshu School was well known for using this within their hamons. Hitatsura (Full) - Used from the late Kamakura period by the Soshu School, but became popular during the Muromachi period by most of the other main schools. Rarely seen in the late Shinto and Shinshinto period, even fewer during the gendaito periods. Sudare/Kikusui ba (Bamboo strip/ Chysanthemum in the river) - Developed in the Shinto period, and a small group kept this hamon style alive during the Shinshinto period. Kyoto or Osaka Schools. Fujiyama (Mount Fuji) - Developed from a notare midare with gunome within the hamon. Modified later in the Shinto period (1600’s) to resemble Mount Fuji. Popular also during the ShinShinto period, but rarely seen during the 1900’s. ©2005 Ricecracker.com. All rights reserved.